Sometimes getting to the great outdoors requires a drive…and in a lot of areas it requires a LONG one! But who says that can’t be part of the fun of your great outdoor adventure? I’ve spent MANY hours in the car as both a child and an adult on road trips. As long as you plan ahead, it really can add to the fun of the trip instead of being a necessary evil. Here are sixteen of my favorite things to do on a long road trip. Probably because I love to eat so much, this one is absolutely crucial to me. Road trip snacks are super fun. Bring along some things you love, but may not necessarily eat at home. I adore jerky, but don’t usually buy it. That’s partly because it’s road trip/camping food to me. I always try to pack things that we haven’t had in a while. Another great idea I keep seeing on Pinterest is the tacklebox idea. Grab an inexpensive tacklebox and fill it with snacks. You can do a family/couple one or one for each person. That way – everyone gets their own personal snack box with lots of variety. I would even take it so far as to involve everyone in filling up their own snack box by setting up a “buffet” of snack choices and having each person pack their own. You can’t go wrong with tunes in the car. I can’t even imagine a road trip without music! It’s fun to prepare some playlists ahead of time because oftentimes your radio reception is pretty crummy as you head out to the wilds. Then load that music onto your phone or even burn it onto a CD. Never have time to read? Long road trips are an ideal time to catch up on your reading list – or a great time to re-read old favorites. Audio books are fun for both the driver and the passengers. Some books are even better when read out loud because the stories really come alive when you hear someone else read them. If you don’t already have a subscription, you can get two free audio books just for signing up for a free trial of Audible . 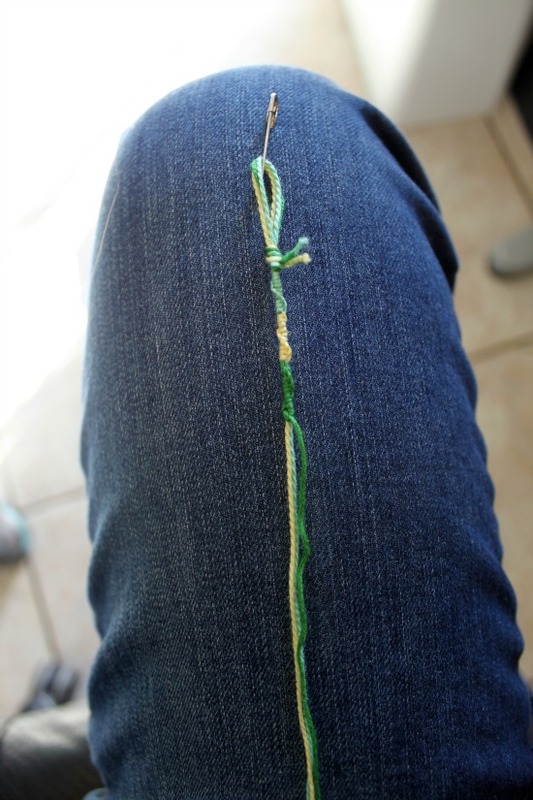 An easy craft that is great for car trips is making friendship bracelets. You don’t have to use them as bracelets either – use what you make as lanyards, key fobs, anklets, or bracelets. Simply bring a little embroidery floss, scissors, and a safety pin with you and you’re ready to rock. I really like this tutorial. Some drivers hate it when their passengers sleep, but others don’t mind a bit. This works especially great when you have more than one driver and you can take turns to catch a little shut eye. And if you can coax your kiddos to sleep while you’re driving – they’ll wake up refreshed and ready for the outdoor activities you probably have planned. Plus, it makes the time go faster for little people who have a hard time being patient for long periods of time. Bring a pillow and blanket and you’ll have a cozy nest. One of the most clever inventions I’ve seen in a while is the seatbelt pillow. People are so smart! Make one or pick one up before you go. Games can really make the time go by quickly on a road trip. Did you play car games as a kid like I did? My brother and I had a fierce slug bug game going on every single time we got in the car. There are a ton of games to play while you’re driving – some require game cards, some don’t. This is just the tip of the iceberg – there are a bazillion games out there. Slug Bug – Keep a running tally of who has the most sightings of Volkwagen Beetle cars (new or old). When a slug bug is spotted – you have to be the first to call out “Slug Bug!” to get the point. 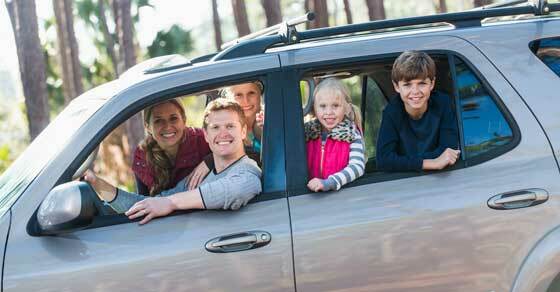 Some families require you to also hit the ceiling of the car while you shout. Banana Game – Keep a running tally of who has the most sightings of yellow cars (buses can be included or excluded – but figure that out before you start playing.) Same deal as the Slug Bug game – you have to call out “Banana!” first to get the point. I Spy – This is a guessing game where one person says “I spy with my little eye (insert clue – for example: something blue with polka dots. )” While you’re driving it works best to do this with objects in the car – otherwise you’ll have driven past it and it’s pretty tough for the other person to guess if they didn’t see it! This is a great game for little kids because their observational skills aren’t quite as awesome as older kids and adults. License Plate Game – This is one you gotta plan ahead for since you’ll need to print out a sheet with license plates (find a great one here.) You simply try to spot as many different states’ license plates as possible. Whoever has the most at the end of the road trip is declared the winner. 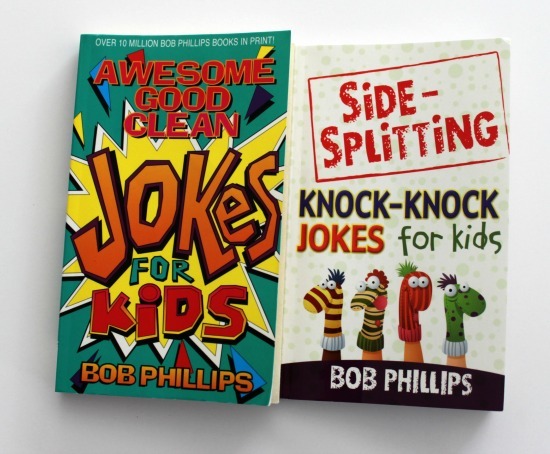 Bring along some joke books and read them to each other. Points for corny jokes! 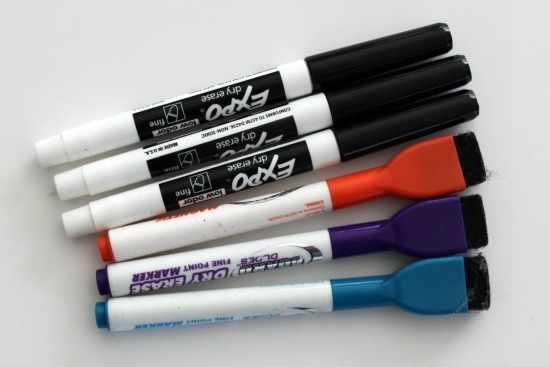 Bring some dry erase markers and use them to draw on the windows. Play tic tac toe, keep track of miles driven, write reminders to yourself, whatever…it all works. They’re easy to wipe off when you’re done and kids love them. 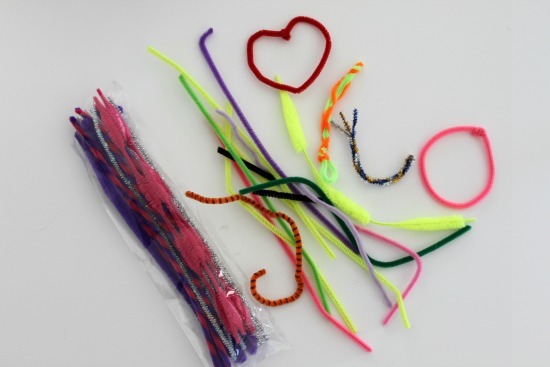 This sounds silly, but playing with pipe cleaners in the car is crazy fun for grown-ups and kids alike. They’re small, not messy, and inexpensive. I highly recommend bringing some along for the trip. You know that music I told you to bring along in #2 above? Well, you should sing to it! Take turns, do it as a group, whatever strikes your fancy. 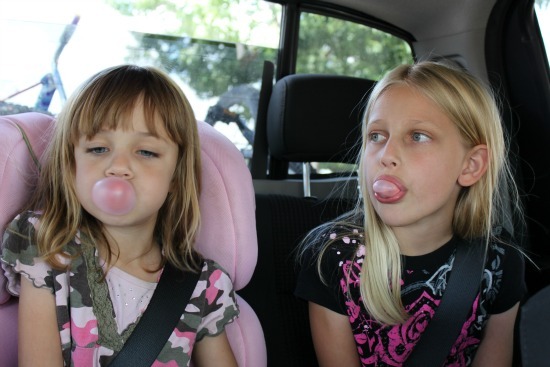 Singing in the car is just plain awesome. I know you’re heading up to some electronic-free outdoor adventure, but why not watch a movie or two on the way (especially great for kids)? Bring along a player or a tablet and have some of your favorites ready to go. Cookie sheets are an awesome easy surface to use while on road trips. They’re a magnet board, hard surface for writing, place to tape your friendship bracelet while you make it, tray for eating, holder for books or games, and the list goes on! 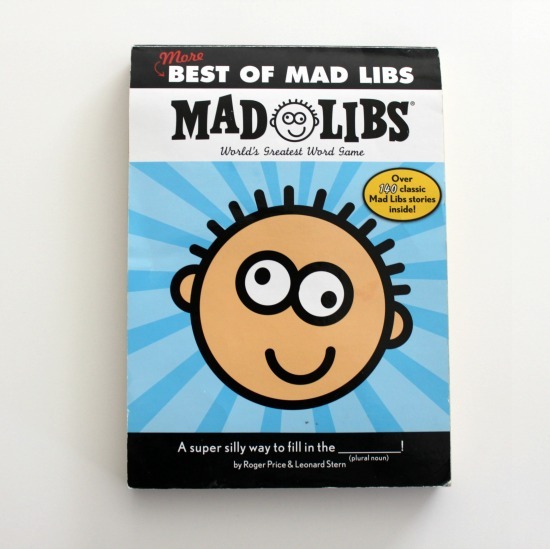 They’re great for kids or adults alike. Bring some magnetic alphabet letters or conversation fridge magnets . 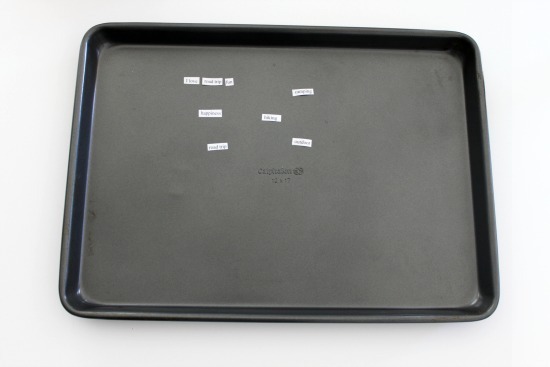 Write silly notes or compose poems using only the magnets. This is a thing…I swear! There is nothing like a long road trip to make you need to stretch out your body. When you’re not the driver – do a little car yoga. What do you do to pass the time when on a long road trip? Tell us in the comments below!